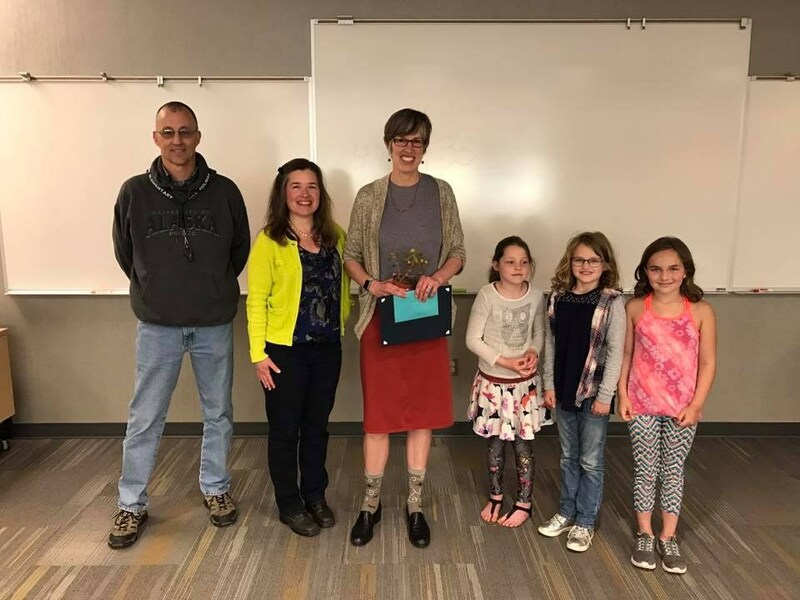 Each Spring the Pullman Public Schools Board of Directors awards one teacher with the "Dedicated Teacher Award". 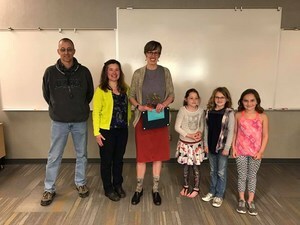 This year, based on a heartfelt nomination from Principal Bill Holman, Franklin Elementary 2nd grade teacher Nancy Nelson was honored with the recognition from the Board. “It is usually difficult to separate just one teacher from a group of hard working, high achieving professionals. Nancy Nelson continues to be an exemplary exception to this rule. She has done more to influence positive climate, student centered focus and continuous improvement than any teacher I have worked with in my career. Nancy seeks specific information about each child, developing extremely positive, effective connections with her students. She differentiates extremely successfully, creating powerful learning opportunities for students of all abilities and developmental stages. Nancy is masterful at setting the stage for students to achieve their full potential. This mindset and related practices have produced some notable and surprising results. Nancy has participated in numerous professional development opportunities, from book studies to trainings in classroom management, standards and pedagogy. She consistently implements strategies and knowledge from these experiences in her own practice, but she is also exemplary in sharing her trainings with others. She has presented at three PSD Learning Improvement Days within the past couple of years on a variety of topics. A number of teachers in all three elementary schools are utilizing management techniques Nancy has shared. Last year Nancy inspired a program at Franklin Elementary called Friday Ice Cream Sharing. Nearly every Friday for the past two years, a staff member invites the school staff to their classroom or space to share their program, a specific effective practice or perhaps just to share things like favorite children’s books. This is a teacher inspired, teacher led activity that is amazingly effective and popular. On several occasions, every single classroom teacher and several other staff members have been in attendance. Friday Ice Cream Sharing has inspired a greater level of commitment toward continuous improvement and has enhanced the collaborative environment at our school. Last fall Nancy engaged the assistance of two families to build and install two little free libraries, one for general literature, the other for math and science games and books, at the front of our school. She has additionally sought grants and other sources to stock these libraries. The libraries have been immensely popular, putting educational materials in the hands of many who could not otherwise afford them. Nancy places student learning above all else. Toward this end she develops fabulous and effective relationships with her students. She attends to their social/emotional well-being and learning as effectively as any teacher that I have worked with. In addition to academics, Nancy fully implements our Second Step curriculum and ideas from our Lost at School book study. The result is a thoughtful and intentional education of the whole child.